The Crimson Void is written by Daniel J. Bishop and published by Purple Duck Games. It is the 6th product in the Campaign Elements series. Disclosure: I am the writer. The Campaign Elements series came about for one simple reason: Quest For It is the beating heart of the Dungeon Crawl Classics role-playing game. In order to seed information, and make those quests possible, I needed to have "drop in" content available. I reasoned that, if I needed this stuff, so would other people, so I commissioned Tim Hartin of Paratime Design to create 15 maps with five to ten numbered locations on them. I needed some advice as to what I should pay for those maps, so I spoke with Mark Gedak at Purple Duck Games. He kindly offered to pick the series up. The product describes the goddess Kala Môr, Her cult, temple grounds, as well as the priests and other beings associated with the location. Included are the complete patron write-up for Kala Môr and the demi-patron write up for the Thing in the Crimson Void. At the time of its release, Kala Môr was the most detailed deity write-up for Dungeon Crawl Classics, with details on portfolio, holy symbol, clerical raiment, organizations, appearance, associations (both allies and foes), holy days, what is considered sacred or sinful, and omens. Clerics are given specific treatment, including an actual list of "Spells of His God" that can be used to determine what spells the cleric knows. A focus on secrecy should offer interesting role-playing opportunities whether the PCs are friendly with, servants of, or even opposed to Kala Môr. I chose a Neutral deity so that there would be a maximum potential for all types of interaction. There is more than sufficient information to allow for PC clerics of Kala Môr. 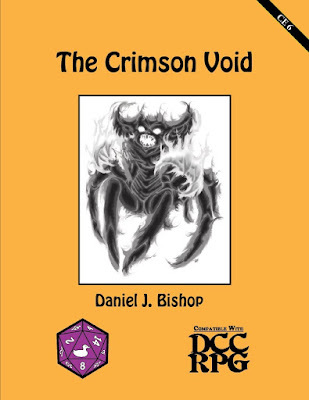 The aforementioned Thing in the Crimson Void is Kala Môr's rival and nemesis, a Dweller trapped within by the vigilance of the temple. It can send demons into the world, though, and the judge is given Type I to V demons for the Void. Reason and means are given for the PCs to summon these demons, and there are potential consequences as well. Crimson Void wraiths and the Whisperer of the Void can create additional complications. This location is not meant to be "fire and forget". It is intended as a persistent part of an ongoing campaign milieu. There is a section on "Squeezing it Dry" (as with all CE Series products) that gives the harried judge some ideas as to how the material can be used throughout years of adventure. There is also a system for ranking supernatural Powers within a campaign milieu that can have actual effects in game play. "My god is stronger than yours!" may actually come up now in a spell duel, for instance. 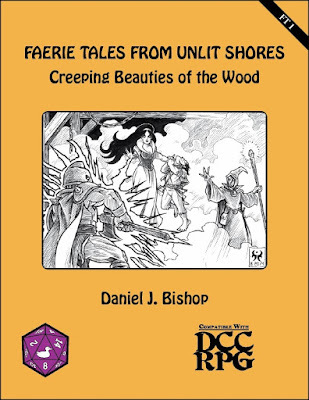 Creeping Beauties of the Wood is the second module in the Faerie Tales From Unlit Shore series, written by Daniel J. Bishop and published by Purple Duck Games. This adventure follows Prince Charming, Reanimator, and gives the PCs the opportunity to deal with the loose ends from that adventure. In addition to the Sleeping Beauty, they are confronted by Prince Charming's two previous un-dead wives, Snow White and Cinder Ella. The adventure is largely a hex crawl, but there are four important locations that break this up: the hiding places of the three un-dead wives, and the Goblin Market. During playtests, the Goblin Market was so alluring to my players that we easily spent the greater part of a game session interacting with it, and the players went out of their way to have their characters return. The adventure includes two patrons: Doctor Chapman and Hizzzgrad, Daemonic Lord of Crawling Things. In the terms originating in Silent Nightfall and used in Angels, Daemons, and Beings Between: Expanded, Otherworldly Edition, Doctor Chapman would be a demi-patron. 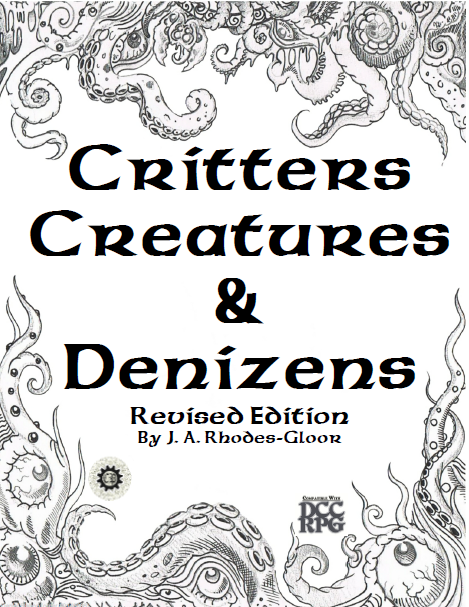 Hizzzgrad is given a full write-up, and is reprinted in the expanded edition of Angels, Daemons, and Beings Between. An effort is made to give the PCs reason to work with Doctor Chapman, and potentially choose him as a patron. The adventure also includes a new race-class: Faerie Animals. These are, essentially, animals which can take human form and which may learn a bit of magic as they gain levels. The faerie animals described herein are suitable for the Grimmswood location; a table for the region around Portsmouth is provided for The Portsmouth Mermaid. While this adventure makes use of traditional fairy tale motifs, it also makes reference to the works of Frank Baum, Lewis Carroll, and Christina Rossetti. There are Appendix N references worked into the text as well, although these are not as overt as in Prince Charming, Reanimator or The Portsmouth Mermaid. I hope they bring some joy to those who notice them. Because the Faerie Tales From Unlit Shores series takes place in a persistent milieu - the events of one adventure have real effects on those that follow - your PCs may enter the Grimmswood many times over the course of their adventures. Even if, say, they fail to encounter Nick Cutter, the Iron Axeman, on their first outing, placing additional adventures in and around the region is certain to give them the opportunity to do so. Most of the things I am discussing in the DCC Trove of Treasures are physical items that you can pick up and hold in your hand. Even in the case of pdf-only releases, you can print them at home to have a physical artifact. The Crawler’s Companion is different. 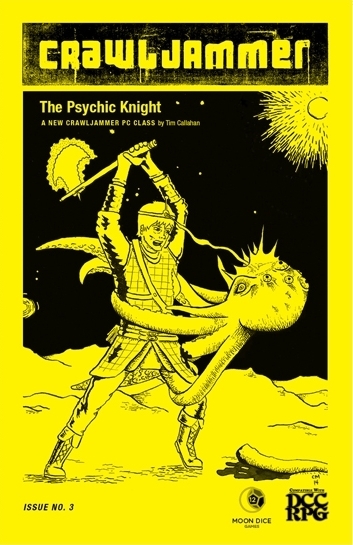 The Crawler's Companion is software developed by Purple Sorcerer Games specifically for the Dungeon Crawl Classics role-playing game. 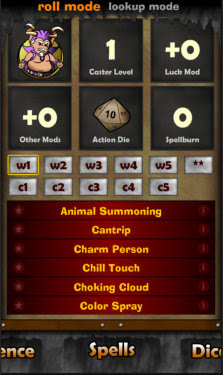 The site describes it as "a free, funky dice-rolling, rules-referencing, chart-crushing Dungeon Crawl Classics RPG utility for the web, iOS and Android." All of the DCC dice, with a "Funky Dice Roller" that lets you see and hear them roll. 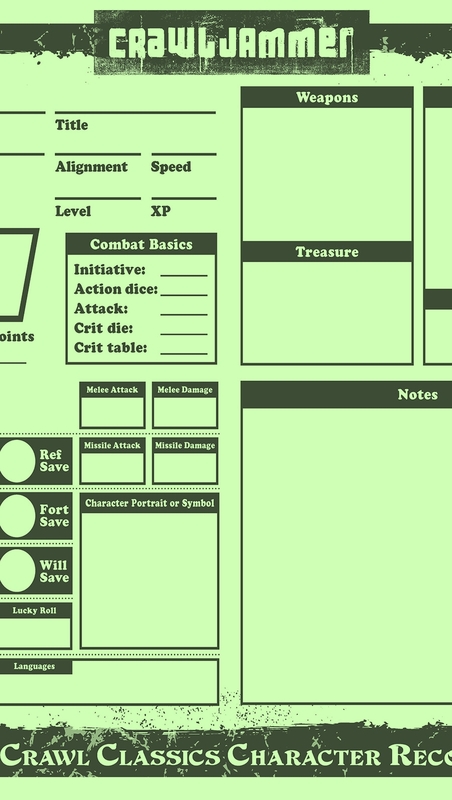 Critical hit charts and fumble charts, for monsters and PCs. Corruption, misfire, and deity disapproval tables for your spellcassters. It is important to note that it is not simply the charts which are made available, but the ability to roll on the charts for a specific outcome. Spell Checks. You can use the application to roll. Rules References. Because sometimes you need them. In addition, there are a lot of automated generator scripts, including those for 0-level or higher level characters (with many options), spell book generation (with mercurial magic effects), demons, dragons, scrolls, swords, and unique monster traits. 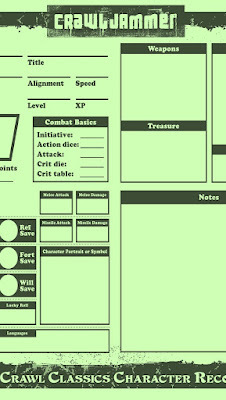 If you are not previously familiar with the Crawler's Companion, but you have played any Dungeon Crawl Classics at a convention or an in-store event, you are probably already familiar with the character sheets produced by Purple Sorcerer: Four 0-levels to a sheet, or an easy-to-read higher level character. There is even an option for making tournament characters, for games like The Hypercube of Myt or Death by Nexus. You could empty the dictionary looking for enough nice words to say about this product. Purple Sorcerer's Jon Marr deserves enormous thanks for creating and maintaining these amazing tools, and Goodman Games' Joseph Goodman deserves thanks for letting it exist. The Crawler's Companion stands, in my mind, as the best testament to the quality of the Dungeon Crawl Classics community. As mentioned above, it is free. You can, of course, support Purple Sorcerer Games' tools directly (there is a link on their site), or by purchasing their adventures (all of which I have enjoyed reading and/or playing). I strongly encourage you to do so. Not everything in this blog needs to be specifically approved for use with Dungeon Crawl Classics. Well made fan content and free extras are listed, too. 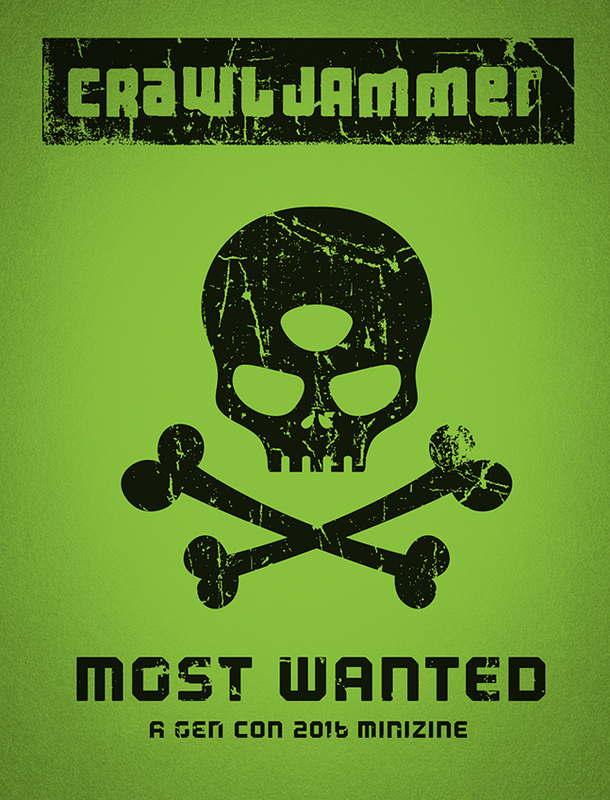 In this case, Crawljammer: Most Wanted is a Gen Con minizine written by Tim Callahan, illustrated by Fred Dailey, and designed by Matt Hildebrand. 100 signed and numbered copies were produced for distribution at Gen Con 2016. When these guys say "minizine", they're not kidding. The product is 1/4 the size of a normal letter-sized piece of paper, and includes six pages plus front and back cover. The page numbers are faces on a six-sided die, so roll 1d6 and see which of these villains might intersect your PCs' path. * The Psi-Klopian: A one-eyed assassin with enhanced psionics. 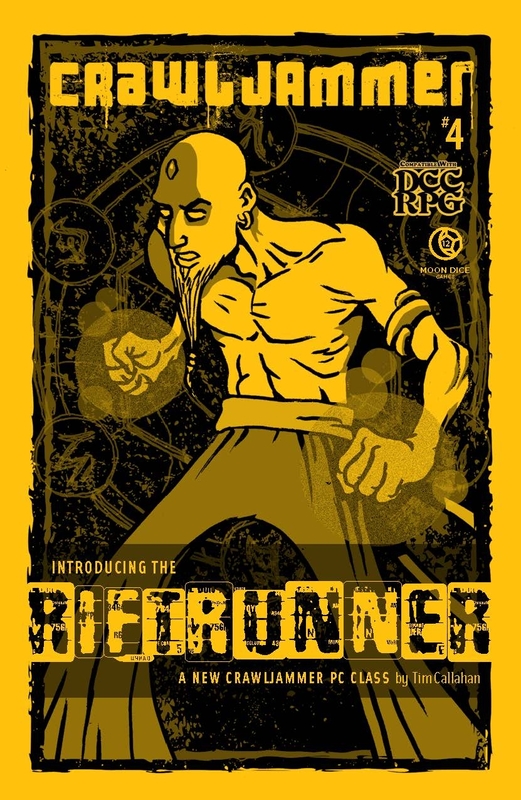 * Dio-Skurr: The "Binary Man", a riftrunner who had become trapped between dimensions of fire and darkness. * Merelda: The genius technomancer who styles herself "Empress of the Machine". * Garrlok: Master of the Over-Flux, the "highest form of magic, unavailable to terrestrial-bound weaklings". * Hel-Zarren: Fiend of the Rage Pit from the Gamma Nebulon dimension. * Shrike: The Star Hunter who seeks agents of the Perilous League for his prey. These villains each offer a different flavor of encounter. They remind me, in many ways, of the early New Gods, Silver Surfer, or Green Lantern comics. Crawljammer #6 is written by Tim Callahan, Sean Ellis, Cory "DM Cojo" Gahsman, and Gilbert Isla. It is published by Moon Dice Games. Fly people. From space. Tim Callahan manages to create a racial class that is both distinctive and flavorful. Probably the most distinctive ability is that a slain yolovar is replaced by a yolovar from another dimension that thinks its the original fly guy. The "matter conversion" power is also unique, without being overwhelming. (1) Ship's Positions: Navigator, Helmsman, and Pitman. Each has a specific job that modifies how a Crawljamming ship works. (2) Combat Options: Attack, Defend, or Flee. Those ship's positions come into play. (5) Upgrading Your Crawljammer Vessel (sidebar by Tim Callahan). "While flying through the phlogiston flux, a Crawjammer navigator reaches out with his unconscious mind, striving to avoid obstacles and to choose the best course. There are times when those mental senses are faulty or an obstacle remains hidden. In these moments, a Random Space Encounter may occur." Judges are provided with 20 such potential encounters, courtesy of Sean Ellis. Four new monsters of the spaceways are provided by Cory "DM Cojo" Gahsman. Phlogiston eels are lamprey-like monsters which feed on blood. Void mites consume the hulls of wooden ships. Rock terrors are armadillo-like creatures that propel themselves like small meteors until they find a likely meal. Eldritch leeches feed on magical energy to the bane of spellcasters everywhere. Tim Callahan offers five tables to help you set up encounters on the fly. Male names, female names, sentient monster names, what monsters might be doing, and the potential contents of boxes PCs may choose to pry into are all covered. Finally, the issue ends with a 0-level funnel by Gilbert Isla. This marks the first published Crawljammer adventure that Tim Callahan didn't write. Importantly, it continues with the high caliber pulp science fantasy feel that the previous adventures excelled in. Crawljammer is discussed on the Sanctum Secorum podcast here. Following up on his article about the Metaphysics of the Crawljammer setting in Issue #4, Tim Callahan now supplies a brief introduction to the new space gods, including their apotheosis from adventurers, and a note on the first and second generations of elder space gods. This is the first of the new space gods, written by Tim Callahan, and given the full patron treatment. 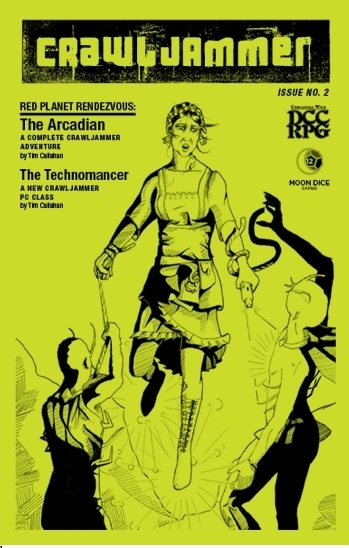 All of the new space gods in this issue are completely kitted out as patrons, ready for your technomancers to bond with. This almost guarantees that the material will see use in play - if your PCs don't care about the God of Scientific Slaughter, their foes might! In addition, there is a class in this issue that makes use of the full patron format. "Once the romantic partner of the thief Sperato, Sister Ultiva ascended to godhood over a thousand years ago after fulfilling a pact with both the god of light Hyperlux and the god of darkness Atronox. Some say she braved the depths of the Abyss itself to retrieve the Heart of the Forgotten Sun, while others say she foiled a potentially cataclysmic uprising of lizardmen alchemists on Jupiter who had attempted to overthrow the natural order of the universe. In her final days as a human, Sister Ultiva was cursed by the warlocks of Zeddix and turned into an abominable creature with four arms. As a goddess, she embraces her multi-armed form and seeks vengeance against those who betray their sworn duties." As the excerpted bit shows, there is a fair amount of both flavor and useful information in the write-ups. A cleric dedicated to Sister Ultiva not only has some history to reference, but knows that the warlocks of Zeddix are her enemies, and that the lizardmen of Jupiter might take a disliking to those wearing her holy symbol. Her relationship to some of the other gods is made clear, as is the importance of sworn duties to her and her followers. There is plenty here to offer the prospective judge or a player hooks for role-playing. "Known formerly as Sperato the delver, Sperato the shadow-hidden, and Sperato of the twenty-seven mysteries, this diminutive thief turned-diety was betrayed by his beloved Sister Ultiva on the steps of the Ossuary of Zeddix and left to die. But the plucky Sperato survived, nursed back to health over twelve long months by the troglodytic fungoids of the bone forest, and this mischievous former adventurer dedicated his remaining years to teaching the primitives of the misbegotten lands, where he developed a massive following of the unloved, the deformed, and the abandoned." "Ten millennia ago, war was a straightforward matter: tribes would clash and the strongest survived. As war continued, complex technologies and strategies emerged as a deciding factor. Wars evolved to the point that they could be won from distant shores with unmanned craft and remotely-guided artifacts destroying an enemy that the victor would never actually face. This method of efficient slaughter is the love of Garun, the commander, the warrior king of ancient Mars. Though his pantheon may sound murderous, he also represents a desire to protect one’s own people from the weapons of the enemy." Although his back story offers few hooks, this deity by Sean Ellis is very likely to see use in Crawljammer campaigns. I am reminded somewhat of The Sword of Rhiannon by Leigh Brackett, although I doubt that this was a direct influence. Needless to say, a truly warlike wizard or technomancer would do well with Garun as her patron. "Of the Goddess in the Machine, it is said that Ars-Eleeta gained cosmic consciousness as man first rubbed sticks together to make fire. Others who have studied the divine texts more closely say that she was the one of the first technomancers to upgrade herself into almost complete cybernetic form when the divine spark of the universe was still fresh. Regardless of her true origins, she acknowledges no morality: Ars-Eleeta’s mission is to always grow, improve, and innovate." The combined work of Sean Ellis and Tim Callahan, Ars-Eleeta, along with Garun, truly demonstrates that Crawljammer is really a "science fantasy" (rather than a "fantasy in space") setting. Although, as a writer, I predominantly comment on the words, I would also like to point out how artists Matt Hildebrand and Fred Dailey really capture almost a Jack Kirby-esque vibe with the illustrations...in particular, Hildebrand's illustration of Ars-Eleeta brings me back to a time when comics had a real "Wow!" factor. It is interesting to compare the new space gods with the Umerican pantheon found in Crawling Under a Broken Moon Issue #11 and Buddy O'Burger in Issue #12. In the post-Apocalyptic milieu of Crawling Under a Broken Moon, the artifacts, myths, and celebrities of pre-Apocalyptic America have become gods. This is entirely appropriate to the setting. Who can forget, in Beneath the Planet of the Apes, how the mutated descendants of modern humans worshiped - and detonated! - an atomic bomb? In the science fantasy environment of Crawljammer, the gods are mostly former adventurers who took the mantle of godhood upon themselves. In Crawling Under a Broken Moon, you might aspire to survive, or become a local warlord, but in Crawljammer you can aspire to become a god. This isn't a criticism of either setting, or extolling either setting above the other. Rather, this shows that taking a different approach changes the way that the players and judge use the materials. You could compare these to the religions of Black Powder, Black Magic (where analogues of real religions are used) or the core Dungeon Crawl Classics rulebook (where most gods are remote beings which do not act as patrons to mortals). My own Kala Môr from The Crimson Void (and its classification scheme for various Deities and Powers) may offer yet another approach. 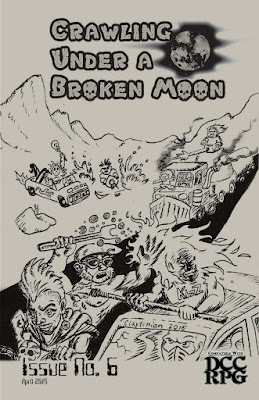 I think it isn't too much of a stretch to suggest that many games may benefit from examining multiple approaches, as would happen if a game was set in a Crawljammer milieu with Earth being the Umerica of Crawling Under a Broken Moon, for example, or the alternate history of Black Powder, Black Magic. Wayne Snyder provides the art for the final article, another class by Tim Callahan. Space is vast, as has been mentioned, and humans are not the only creatures who worship strange gods. The ecclesiast is neither a cleric or a wizard, but something between which is a little of both without being all of either. Unlike other classes, any race can become an ecclesiast. This last is probably necessary when faring among so many strange beings that are not automatically meant to be killed. This class is meant to be used with gods that are fully statted out as patrons - like the new space gods! - so its utility in other settings is limited to those gods that are either set up as patrons, or whom the judge feels like statting out. Tim Callahan offers some brief notes on the creation mythology of the Crawljammer setting. Author Sean Ellis describes Elysia, a sort of pocket dimension where Crawljammer elves rule. There are rules for what happens should you try to enter the portal to this version of Elfland, and a brief discussion of adventure opportunities. milieu that might easily fit into other Dungeon Crawl Classics campaigns. 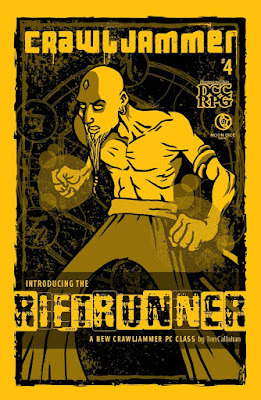 Essentially, a riftrunner has the ability to step out of reality, teleporting in a limited way at low levels, and then casting a form of planer step at mid- to high-levels. They have a special form of spellcasting, and they can make "phlogiston fist" attacks, giving them extra damage for unarmed combat. Perhaps my capsule description doesn't do the class justice. It appears to be well designed ("balanced" if you will, so as not to steal another class' schtick), and it looks like it would be fun to play. I have yet to see a riftrunner in play, though. Riftrunners have six "domains", based on alignment, and Tim Callahan describes them here. Each time a riftrunner attempts to manifest a spell in a given domain, he rolls 1d10 to determine which manifestation is triggered. A roll of "1" is "phlogiston feedback", which isn't desirable. Phlogiston feedback isn't as long-lasting as corruption or patron taint, but it will happen twice as often. 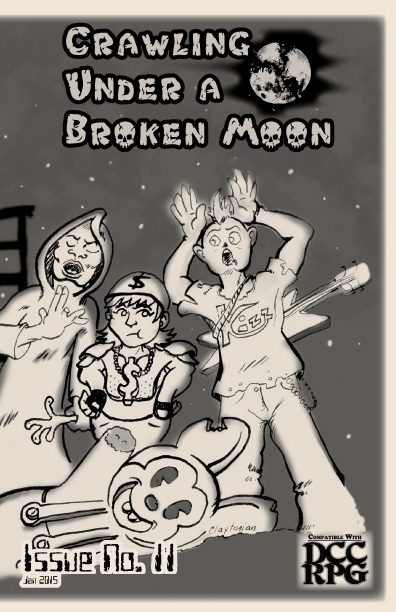 Finally, the issue is rounded off with another Tim Callahan adventure, this one featuring un-dead space pirates. And an auction. And a nightclub. Crawljammer #3 was written by Tim Callahan, Sean Ellis, Lauren Callahan, and Mark Malone. It was published by Moon Dice Games. Let's take a look inside. Space is vast. Even when the judge narrows play to a single solar system, we are talking about omets, asteroids, nine planets (Pluto is a planet, not a dwarf planet, in Crawljammer, as in the pulps that inspired it), and over 170 moons. The area between these objects is even greater. If you think detailing a barony or a continent is hard, imagine the amount of prep work an entire solar system would take, if that is what you had to do. Science fiction role-playing games have dealt with this issue since Traveller hit the market, and there are various approaches one can take. All of them seem to boil down to two possibilities: Use random tables to quickly devise data, or use some means to tell the players where the action is. Most games, if not all, use both methods, and the Crawljammer setting is no different. Enter the Perilous League. Author Tim Callahan provides a method of directing your players towards the centers of action. The Perilous League has a long history, including the bare bones of past adventures that the judge can build on....and similar write-ups for future adventures that can include your PCs! There is also some ambiguity about the Perilous League's history and ultimate goals, which means that the judge has a great deal of leeway in how they present the material. Although it is not explicit in the text, it is conceivable that in some cases, your PCs may even oppose the League! Perhaps they really are a force for good. Perhaps, ultimately, all they really want is the return of Cthulhu and the Great Old Ones. Next up, Tim Callahan gives us a psychic class which uses a simple and intuitive system for psionics. Star Wars seems to be an obvious influence, but Star Wars in turn was inspired by the Barsoom novels of Edgar Rice Burroughs, and Edgar Rice Burroughs was inspired by Edwin Lester's Phra the Phoenician and Gulliver Jones. When I wrote The Vault of Ash for Moon Dice Games, the Martian Skeleton Man psionics are a modified version of the rules found herein. Mind Games, by Shield of Faith Studios, offers an alternate psionics system (which is more complex), and additional psionics rules can be found in Drongo: Ruins of the Witch Kingdoms by Leviathan Publishing and The Wizardarium of Calabraxis published by Kill It With Fire). If you are looking for a simple system, with a class that can easily be fit into any flavor of Dungeon Crawl Classics, this is it. If you are looking for something more complex, Sean Ellis provides advanced psionics rules as well as the the B’rabo Jast, oro “Blubber Uglies” which devour brains. These rules mesh well with the Psychic Knight class, and I see no reason why a Dungeon Crawl Classics milieu (Crawljammer or otherwise) could not have multiple psionics systems operating within it. Random tables are great for inspiration, and this one by Lauren Callahan allows you to create random items that might be encountered in an adventure. The table uses 1d12 with four columns, but only one column determines effects, so the prospective judge will want to take this table as a good start and add more rows up the Dice Chain. "In ancient times deep within the nine rings of Ouranos, the void wizards in their aethereal towers initiated pacts with a cosmic intelligence. The godless rituals they performed resulted in a transmutation of this element of chaos to a substance that could be harnessed. Solve et coagula. With this knowledge these alchemical sorcerers devised weapons of unimaginable power. One such device, the Promethean Lance, treasured by kings immemorial, was a weapon of chaotic phlogiston energy." Mark Malone describes a powerful, but unpredictable, weapon for your Crawljammer adventures. The issue is rounded off with an adventure that follows directly from Red Planet Rendezvous: The Arcadian in Issue #2. Once again, Tim Callahan demonstrates a commanding knowledge of the space fantasy genre, particularly as pertains to Appendix N fiction and the early pulps. Crawljammer #2 was written by Tim Callahan and Tom Hall, and published by Moon Dice Games. A few things that can happen between planets, supplied by Tim Callahan. Included are write-ups for the Cactus Men of Alpha Centauri, the Moon Octopus, Space Pirates of Pluto, Spore Slavers, Violent Voidspace, and the White Martian Tribunal. Tim Callahan supplies a new class, which combines magic and technology. 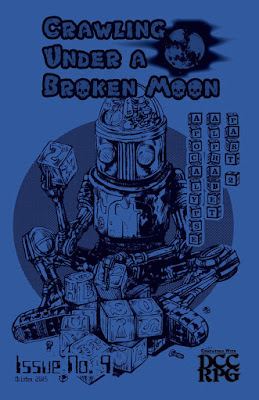 If you are running a Crawling Under a Broken Moon campaign, you may discover that this is an interesting compliment to the Technologist in Crawling Under a Broken Moon #1. Because the Technomancer requires new spells, Tim Callahan provides them. Specifically: Hyper-Repair, Speed, and Trap Engineering. One could easily imagine uses for these spells outside the Crawljammer milieu, and Hyper-Repair may be especially useful when Crawling Under a Broken Moon. Author Tom Hall introduces Hail Bob's, a bar affixed to a comet, a table to create some random "vagabonds" who might be drinking there (including plot hooks! ), and a table for creating cool random space cocktails. This is very reminiscent of some of the earlier science fantasy pulps - in particular, I am reminded of the "Northwest Smith" stores of C.L. Moore and some of Leigh Brackett and Frederic Brown's work. A 2nd level adventure by Tim Callahan sees the PCs explore a disabled prison ship in orbit around Mars. Needless to say, all is not as it seems, and hi-jinks ensue. Let's see what this issue contains. Tim Callahan describes the basics of the Crawljammer setting, including rules for space travel, ship-to-ship combat, and alien planets. Table 1.2 ("What Makes This Planet Different?") allows the judge to make planets unique without requiring loads of extra rules or fiddly bits to keep track of. There are only eight entries on the table, but the clever judge can use them as inspiration to create dozens of unique worlds. Author Tim Callahan describes the various types of space-faring vessels in the Crawljammer setting. Eight specific examples are given. This is more than enough for a judge to start a Crawljammer campaign. One of the examples, the Void Ziggurat, is a mobile adventure location. The Crawljammer setting makes use of a science-fantasy version of our own solar system. Tim Callahan provides an overview here. The write-ups demonstrate a real understanding of the pulps, not limited to Appendix N, and small references are made that should bring a smile to the judge's face. There is an implication that the Crawljammer cosmology extends beyond our own system (the Earth "known throughout the galaxy for its abundant natural resources and its sometimes-overly-passive, sometime-overly-violent inhabitants who tend to stumble into situations well beyond their understanding"), but nothing set in stone. One gets the impression that some aliens find it easier to travel to Sol than we do to travel to, say, Alpha Centauri. celestial bodies in our solar system." This keeps a tight focus on the planets, asteroids, and moons of our system, while allowing the judge to set special adventures on other worlds orbiting distant suns. This is a new character class, by Tim Callahan, for lizardmen from various planets. Author Andrew Callahan supplies Table 1.3, so that your newly created lizardman can have an occupation, just like everyone else. Twelve occupations are given. Finally, Tim Callahan offers an excellent 1st level adventure, which made my short list for the 15 Must-Have DCC adventures at the time it came out, although it failed to make the final cut. This failure is not at all a criticism of the adventure, but a testament to how many great adventures had already appeared for Dungeon Crawl Classics at that time. 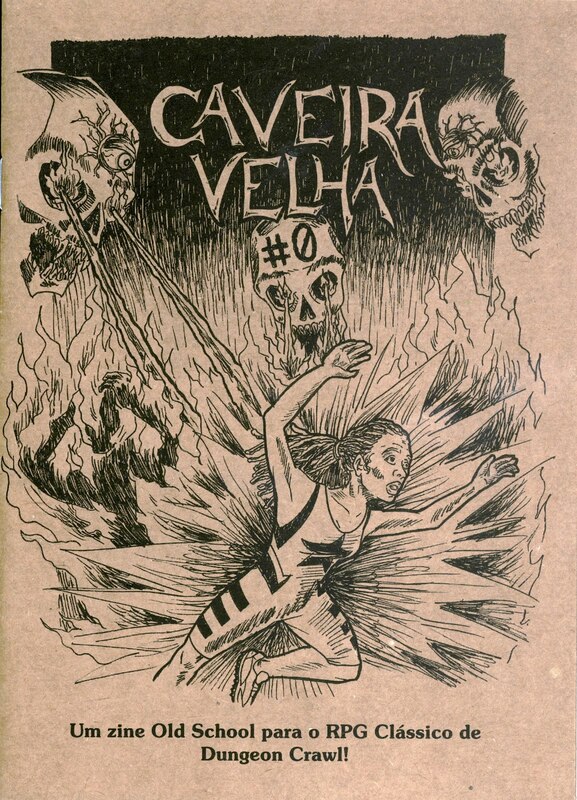 This adventure takes place on Venus, and is to the best of my knowledge the first extra-planetary adventure published for Dungeon Crawl Classics. Adventures such as Peril on the Purple Planet or my own The Dread God Al-Khazadar are descendants of Tim Callahan's genius. The adventure itself is pure Edgar Rice Burroughs in its themes and execution. Kudos! 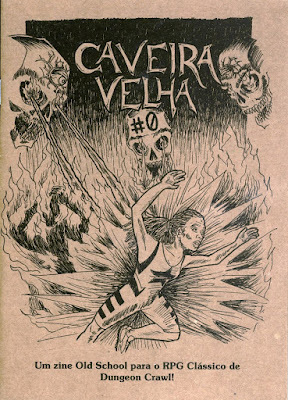 Caveira Velha is a Brazilian zine for Dungeon Crawl Classics. The name means "Old Skull". Hopefully, an English translation will become available, but, equally hopefully, it will retain its Brazilian name. I have managed to acquire the issue in its original Portuguese. It will take some time to scan and translate using Google, but this entry will be updated when I have done so. 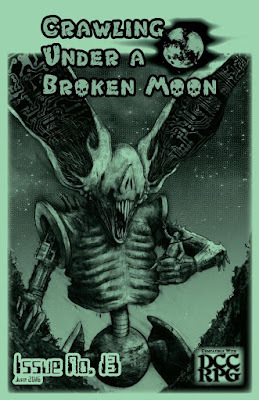 Written by Reid San Filippo, Sean Ellis, and Ryan Moore, and published by Shield of Faith Studios, Crawling Under a Broken Moon Zine Collection Volume 1 is a compilation of the first four issues of Crawling Under a Broken Moon. Although I have all of the individual zines, my "completest sense" was tingling, so I picked up the compilation as well. My copy is well put-together, in terms of paper stock, printing, and binding. Angels, Daemons, and Beings Between: Extended, Otherworldly Edition is written by Daniel J. Bishop, Paul Wolfe, and David Fisher, and published by Shinobi 27 Games. The original version of Angels, Daemons, and Beings Between is discussed here. Disclosure: I wrote a good portion of this book, and contributed two illustrations (one of which became a dual illustration with work by David Fisher). This version is the brainchild of David Fisher, who rescued it from the dustbin of infamy are made it shine. Both myself and Paul Wolfe contributed new patrons, in roughly the same ratio as the original book. There is a physical copy of this book "speeding" through the postal system toward my eager hands. When it arrives, I will update this listing. 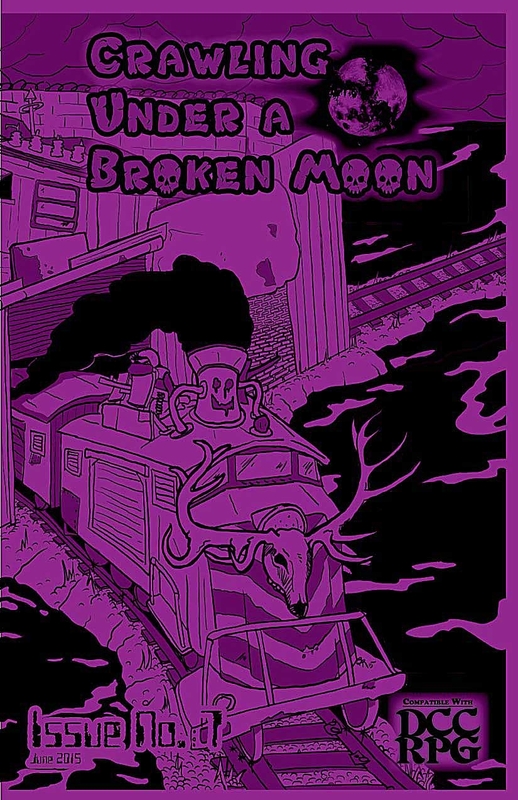 Crawling Under a Broken Moon #15 was written by Reid San Filippo and Jon Carnes, and published by Shield of Faith Studios. This issue is the second part of the Dinotastic Park semi-hex crawl begun in Issue #14. Disclaimer: I received a free review copy of the pdf for this issue. Of course, I then bought the paper copy as well. Mentioned several times in the first part of the semi-hex crawl, this is a company of thugs which is working toward becoming "a halfway legitimate paramilitary group" within the adventure setting. They control the Free Trader's Rest, a shanty town that the PCs will probably encounter at some point. The shanty town is outside the dome surrounding Dinotastic Park, and the Red Claw Raiders maintain a sort of monopoly on access to the dome. With the grudging blessing of the Red Claw Raiders or not, the PCs need some way to access the dome before they can explore the park. Of course, they can always use the gates described in Issue #14. There is a large lake nearly bisecting the park. Characters will probably want to cross it. There are several possible ways to do so, but all of them have their downsides. This article includes a breakdown of the major inhabitants of the western side of Dinotastic Park, as well as some random encounters. Hexes 135-170 are described. 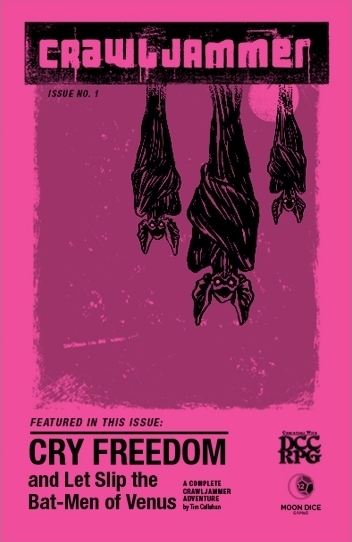 For Hexes 100-134, see Issue #14. Descriptions of major features of the western half of Dinotastic Park, including the MechaTemple of the Ultimospark, the Red Claw Basecamp, and the Tilted Towers of the Once-men. A psychic cave person, using the rules found in Mind Games (also by Shield of Faith Studios). Robotic priests ordained by the Ultimospark, capable of converting hostile AIs. Naturally, this class includes a description of the Ultimospark, the "Manifold Entity of Artificial Perfection". A patron write-up is not included. I really like the idea of special classes being "unlocked" for players through the agency of playing through specific adventures, or exploring special areas. 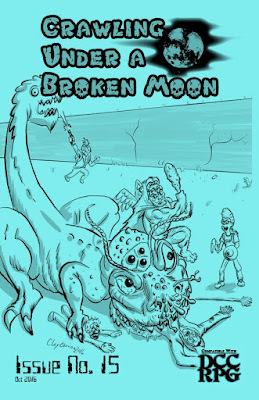 Between these classes, and the Saurian classes of Issue #14, there will be a real difference between Crawling Under a Broken Moon campaigns where Dinotastic Park is explored or not. To my mind, this really speaks to the "Quest for It" ethos of Dungeon Crawl Classics. 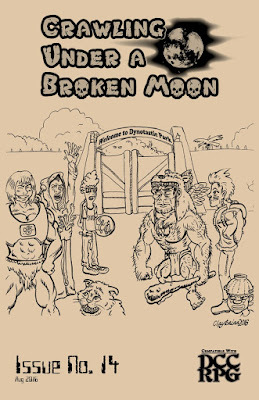 This issue brings us the Bumpkinoids (alien rednecks), five more Purebreed Dinosaurs (two of which are technically marine reptiles), the Mecha Megasaurus (exactly what it sounds like, only bigger), the Robo-Faithful (dedicated to the Ultimospark), the Tortoise Guardian (which is a great creation! ), the Wise-Eyes (powerful Once-men psychics), and Empty-Ones (Cro-Mentalists who have lost "their morality, sense of community, and empathic connection to any other living thing" after being seduced by inhuman things in the depths of the Universal Metaconsciousness. If you think that's a lot to fit into a single issue, you are right! But none of it is given short shrift or feels cramped. 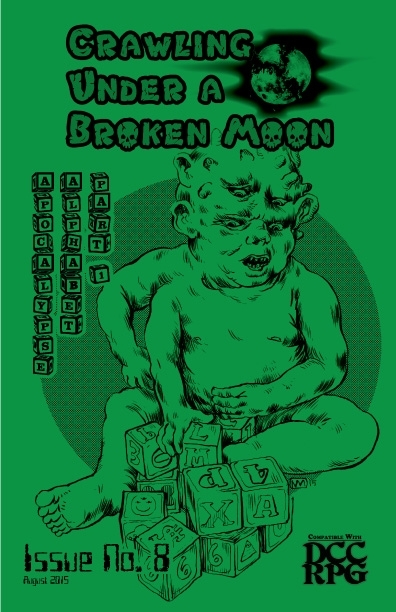 Crawling Under a Broken Moon #13 was written by Reid San Filippo, Diogo Nogueira, David VC, and Ryan Moore. It was published by Shield of Faith Studios. 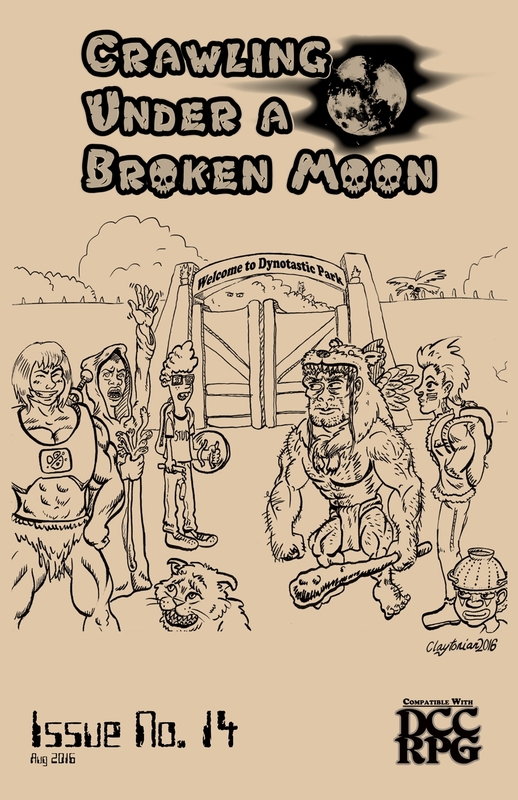 The fantastic cover is by Aaron “Nunkeymutts” and Nate Marcel, and internal art is by Nate Marcel, Claytonian, Matt Hildebrand, Diogo Nogueira, Mitchell Hudson, and Aaron “Nunkeymutts”. Author Diogo Nogueira provides a series of tables to help kickstart your creativity. The bones of a great post-Apocalyptic adventure are a few die rolls away. For example, the adventure's goal to to find a technological artifact from the last age from a technology museum in a ruined city. But an intelligent liquid-metal being that can take any shape is tracking them, and a wandering mutant tribe may also become involved. A fatalistic cult seeking to spread chaos offers complications, but if the PCs succeed, they will have gained a crystal of power that came from the stars! Flesh out the skeleton as you see fit. 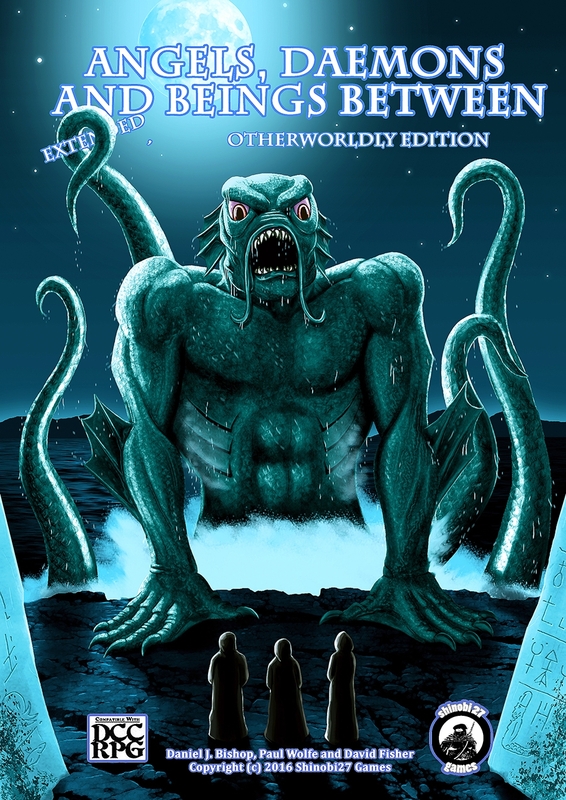 This issue examines The Rail Tunnels of the Delphia Beast, by Reid San Filippo. In the ruined subway tunnels of old Philadelphia, your PCs are the prey. Includes tables for players prone to searching the surface ruins. David VC, who created the Hologram and did a Racial Recast on Halflings in Issue #11, turns his considerable talent on recasting the Elf class as the "Gray". Yes, as in aliens. Included is the Gray Directorate, a patron-level entity. No actual patron write-up is included. 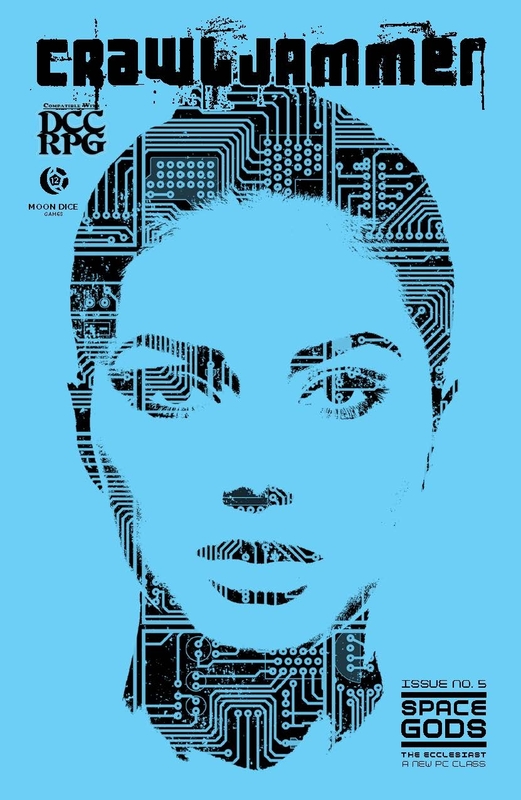 Described as an "homage to the A.I. killing machines of the original gamma irradiated future", author Ryan Moore gives rules for creating ancient machines that have survived to fight in the post-Apocalyptic future. Tables are provided to create unique Deathbots. An example is provided. The dreaded Railipede is a technomagical infusion of giant centipede and subway train. Face at your own peril. The Luck Eater is an extradimensional demon that eats Luck. This last creature is usable in any flavor of Dungeon Crawl Classics gaming. 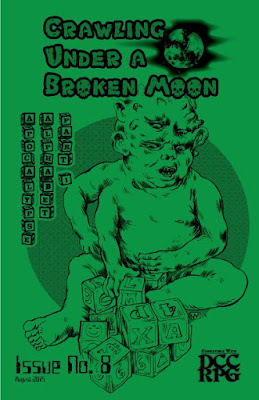 Crawling Under a Broken Moon #12 is written by Reid San Filippo and David Baity, and published by Shield of Faith Studios. 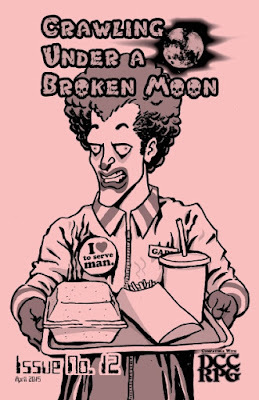 This issue describes minor god and patron Buddy O'Burger, a fast-food mascot that became something more after the Apocalypse. 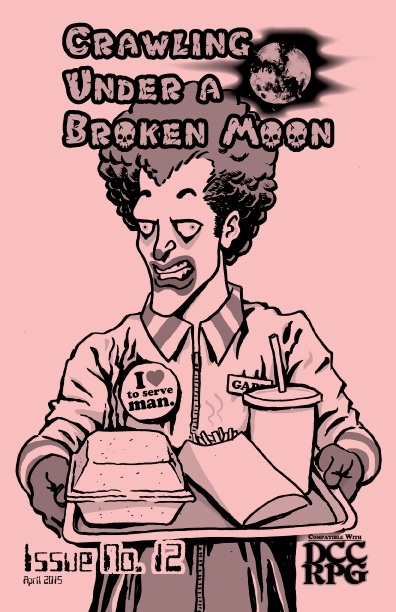 Buddy O'Burger is a clown god of "feasting, customer service, and cannibalism". What do you get in this issue? All the toppings, of course! The burger mascot before the fall of civilization, and how he became a god afterwards. A short account of the current cult, from an outsider's point of view, with a section on "Heretics and Food Critics"! The in-depth information the judge will need to bring the burger cult to life. Adventure hooks for the burger cult. Have you ever wanted to be a clown? No, not dress as one. Become one. Have you? Now you can. A full (and well crafted) patron write-up for the Burger God. What is the Prize in that JollyMeal Box? Cheap plastic toys that have some magical abilities. You can use them, but they break easily. What would a clown mascot of a burger franchise be without friends? Herein we find the Grumpus, Big Beef and the Burger Boys, the Fry Filcher, Nugg-a-saurus Rex, Doctor Dippinstein, and the Pie Guys. Because you need magical items with a Buddy O'Burger theme. This issue introduces the gentle reader to the Clownugs (Buddy O'Burger's enforcers), the Clownauts (bigger versions of the same), and the Fryder (big spiders made of french fries). An article on how to create lesser mascot gods, complete with Tast-E-Cone as an example. 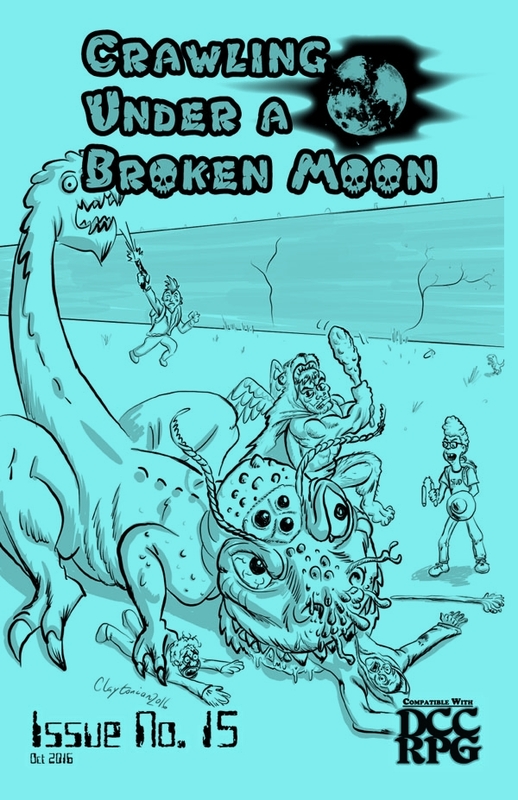 Crawling Under a Broken Moon #11 is written by Reid San Filippo, David VC, and Tim Bruns. It is published by Shield of Faith Studios. This is a jam-packed issue, with lots of cool stuff to play with, so we'll jump right in. Tim Bruns and Reid San Filippo offer a "treatise on the faiths of Umerica and their clergy", including new rules for clerics that worship the various beings described. There is plenty of room for other deities in the wastelands...after all the God of the Pit from Issue #7 is not represented! Still, you get a lot in a small amount of space with this article. Classica: "The goddess of Rhythm and Order, she binds all things together through music, rhythm, and focus." Santa: "[T]he jolly avatar of giving, hope and joy". S’aganoid: An entity whose "worshipers seek both knowledge, and the truth behind it." This is all types of knowledge, so they are sometimes very welcome, and sometimes shunned. The Lords of Light: The entities to whom Aetherian heroes and honorable barbarians call out to, the Lords of Light "appreciate reckless, selfless actions for the benefit of a lawful cause." Anyone familiar with Thundarr the Barbarian is familiar with their name. $ (Cash): "The impartial goddess of barter and wealth, her priests are often called upon to mediate in trade negotiations and disputes." Grokk: The god of the twisted Wilds and the Wastes described under the Jack-O-rang-utan entry in Issue #10. His followers are, effectively, the druids of Umerica, who "seek to be one with nature and the universe, and view those who threaten their peace and serenity as dangerous radicals who must be stopped or destroyed." Kizz: First mentioned in The Mall Maul in Issue #3, and then more fully described in Issue #4. "Kizz takes center stage as a god who both unites and divides the other gods. Some stories have Kizz and Classica fathering Technos Discos, but many of the god’s parentage is to be called into question when Kizz is involved. Kizz’s worshipers live life loudly and awesomely in their search to attain “Enlightened Awesomeness”." Petrolex: "Fuel is love, fuel is life, fuel is freedom." Nuka: "The Mother of Mutants" would just like to see a healthy glow on her followers' cheeks. Or radiating out from them. Or something like that. 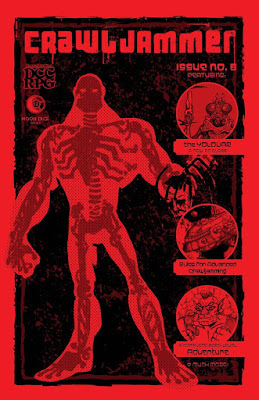 Theszolokomodra: First encountered in The Mall Maul in Issue #3, and more fully described in Issue #4, "Theszolokomodra is usually a neutral god, but he has so many heads that many can manifest as lawful or chaotic, thus his worshipers can be of any alignment. Followers are entrusted to seek out knowledge and experience." Elmos: "The Evil Puppet Master and corrupter of children, Elmo’s is a master manipulator, hiding evil intent behind a pleasant smile and a friendly demeanor". A masterpiece. Silk: The Golden Lord of Lies. 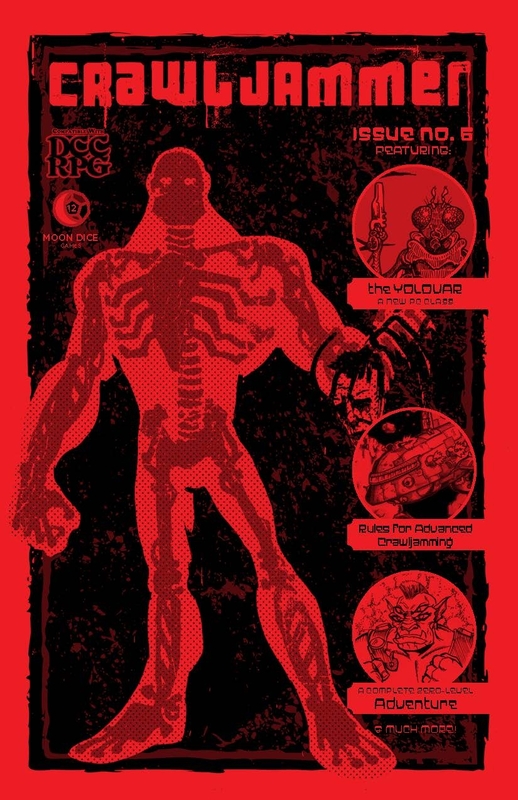 Technos Discos: The chaos god of music was first mentioned in The Mall Maul in Issue #3. "His followers tend to be young, wandering souls who bring beats to places where there were none. Preferably to places where prohibited." Yyaallaayy: "The outer dimensional lord of madness and creature of chaos. Few understand if only the mad seek to worship Yyaallaayy, or if those that seek to worship him go mad." Perhaps names from a battle cry in Thundarr the Barbarian? You would think that bringing a whole new pantheon to light would be enough for a single issue, but you would be wrong. Author David VC brings an alternate take on the post-apocalyptic Halfling class as the "Feral Urchin". And it is good. Depending upon alignment, a Feral Urchin may be a Wildchild (usually Chaotic), a Slinger (usually Neutral) or a Nerd (usually Lawful). Wildchildren invoke their Patron (Zendakk) to enter the Wild Rumpus, where they transform into small Beasts "with an assortment of features from various predators. The Beast’s fur/feathers/scales are often garishly hued." This is pure, and brilliant, Where the Wild Things Are. Slingers "are deadly shots" with any thrown or hurled weapon - think the feral boy in The Road Warrior. Finally, Nerds "are beloved of their Patron, a sentient algorithm named (Ur) K3L." Nerds are very good at repairing old tech or using computers. But, of course, you cannot have feral children who refuse to grow up without invoking Peter Pan, and the Feral Urchin does so as well. This is about as close to perfect as one can get. And yet there is still more! This article on post-Apocalyptic armor and new gear includes armor made from tires or scrap, protective sports gear, force field belts. Weapons include the necessary chainsaw and compound bow as well as the grill tank bomb and saw blade slinger. There is a subsection on cheap (damaged) goods and quick fixes. This bit may be usable for Dungeon Crawl Classics of any flavor. Okay, that has to be all this issue can hold, right? Wrong. Next, David VC introduces a Hologram AI class that is part Star Trek: Voyager and part Tron, while fitting wholly into the Umerican landscape of Crawling Under a Broken Moon. As with the Feral Urchin, this is an excellent class. The Scorpionoid is a centaur-like scorpion creature that is easily addicted to caffeinated soda pop, and are willing to fight as mercenaries. Preferred payments are fresh blood, raw sugar, or honey. Or perhaps that last can of Coke. A quick table to use when a deity calls in a favor from a PC's cleric. This is most definitely usable at any Dungeon Crawl Classics game table that hasn't done away with clerics altogether. 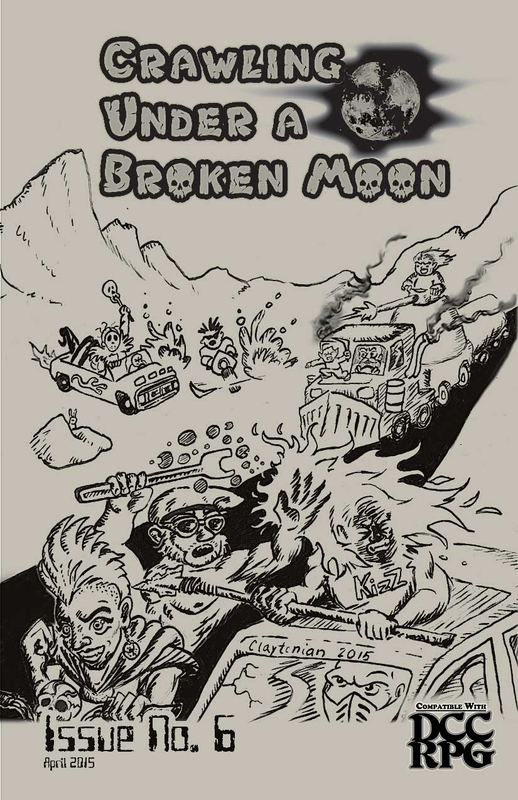 Crawling Under a Broken Moon #10 was written by Reid San Filippo, Kevin Searle, and Ryan Moore, and published by Shield of Faith Studios. 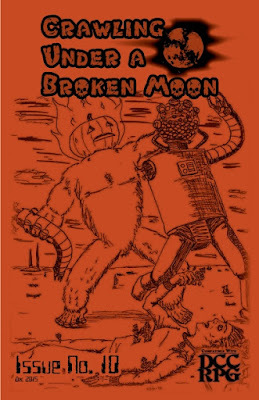 This issue is, essentially, a bestiary for your Crawling Under a Broken Moon campaigns, and almost every creature comes with Adventure Hooks to get you started. No monster book is every completely useless to judges using a different setting, and this is no exception. There is always something that you can convert, or reskin, to fit your exact needs. 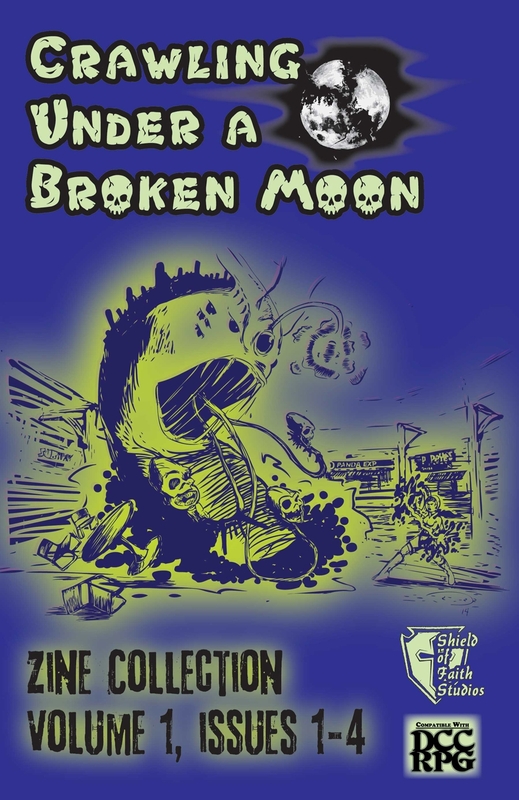 Yet this collection not only fits the Umerican setting of Crawling Under a Broken Moon, but it shows the variety of post-Apocalyptic worlds enfolded into the setting. In essence, Battle Cat from Masters of the Universe, harkening back to Issue #5 (where it actually appears on the cover). You need to bond with an Aetherian War Cat; it will not let just any warrior hop on its back and ride it. This creature's write-up makes use of Mighty Deeds from Steel and Fury, published by Purple Duck Games, a move I strongly support. Referencing other authors, or using their Open Gaming Content, helps create hooks and links between material that the clever judge can capitalize on. Highly intelligent parasites that creep inside you in the outhouse. Shades, perhaps, of Stephen King's Dreamcatcher. This creature, by Kevin Searle, is a natural for the ruined urban environment - giants that appear to be made of concrete and asphalt. Of course, some of them are cyborgs. 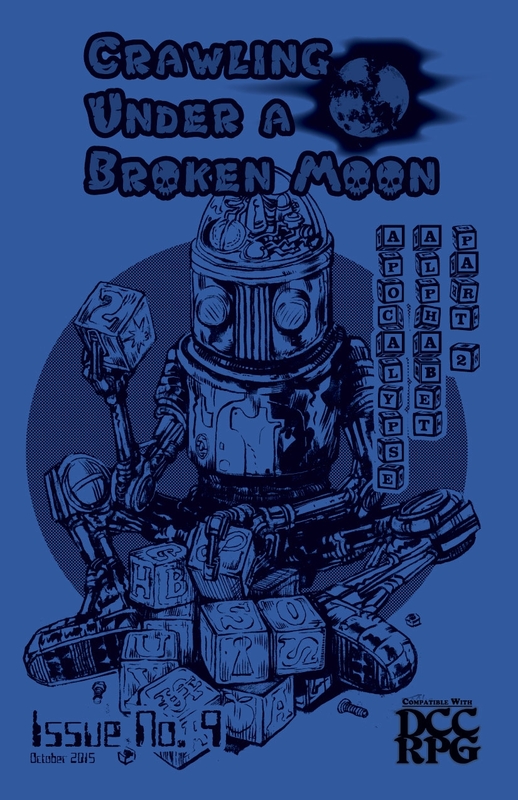 Author Ryan Moore give us robots created to fight the wars of the Ancients. These huge (think jumbo jet) constructs roam around capturing prisoners or killing folks according to their programming, unless they are being used as a mobile base for a cybersorcerer. Their captives are not safe - there is a d6 chart for what happens when the holding cells are full. Most of the results are quite unpleasant; two of them only moderately so. My favorite creature in this issue, the Fruiti-Slush ooze is both hilariously funny and frighteningly able to dispatch careless PCs. "In the ruins of just about every city yet standing there are small buildings with faded posters touting that delicious frozen fruity beverages are available inside. The citizens of the old world must have been obsessed with them considering how many different types and flavors seemed to be offered. "Why these particular beverages were awakened by the multi-dimensional cataclysm that nearly destroyed the planet no one can say. All that is known is that they now have animated into acellular masses of creeping frozen protoplasm that hungers for the moisture of living beings. The rustling whisper of their icy crystalline texture and an unnatural, fruit scented chill in the air are the only warnings that one of these horrors is near." Orangutans with jack-o-lantern heads that fling flaming poop. They guard areas claimed by Grokk, the "god of the twisted Wilds and Wastes". Should you attempt to reclaim these areas for civilization, you may encounter their unnerving chatter or insidious sabotage. These un-dead cybernetic unicorns use nano-necrotech to turn innocent maidens into the un-dead "Wight Ladies" that serve them. An alien race of master manipulators which are, thankfully, not just another take on the Beholder from Dungeons & Dragons. This is a creature which might employ PCs, might oppose them, or might be the buyer for their ill-gotten goods. It is difficult not to be charmed by their presence. Here the issue delves into serious horror with the Harpoonnik and the Scorpain, twisted horrors that belong to the dystopian futures of films like Devil's Pass and writers like Clive Barker. You could use the provided examples to create a truly creepy adventure...but you are welcome to create more. Alien cybernetic six-legged dino-centaurs. They are always encountered on a mission, most of which promote conflict with the locals. These missions apparently replace the "Adventure Hooks" for this creature, as this is the only creature listed without an "Adventure Hooks" section. On the other hand, they are armed with some neat weapons. Your PCs may end up with some of these, if they are lucky. Want a little kaiju action with your post-Apocalyptic fantasy? Here you go. Using the "Gifts of the Glow" table and a little imagination, the prospective judge can have their very own Cloverfield or Godzilla. 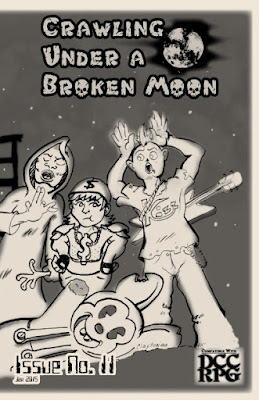 Crawling Under a Broken Moon #9 was written by Reid San Filippo, Ryan Moore, Sean Ellis, R. Dale Bailey Jr, and Eric Fabiaschi. The cover is by Nate Marcel, and the interior art is by James Yoder, Nate Marcel, Frank Turfler, Matt Hildebrand, Claytonian, and Fred Dailey. The last, bonus, table is a replacement for Table 1-2: Luck Score in the Dungeon Crawl Classics core rulebook. This allows for birth augers more in keeping with the ruined wasteland of Umerica. Between Issues #8 and #9, prospective judges should have more than enough inspirational material to create adventures and strange locations for years to come. Crawling Under a Broken Moon #8 was written by Reid San Filippo, Ryan Moore, R. Dale Bailey Jr, and Eric Fabiaschi, and published by Shield of Faith Studios. If you are a fan of products like The Dungeon Alphabet and The Monster Alphabet, this issue (and Issue #9) are for you. As with those products, the art is important to this one, with a cover by Nate Marcel and interior at by James Yoder, Nate Marcel, Frank Turfler, Matt Hildebrand, Claytonian, Diogo Nogueira, and Fred Dailey. 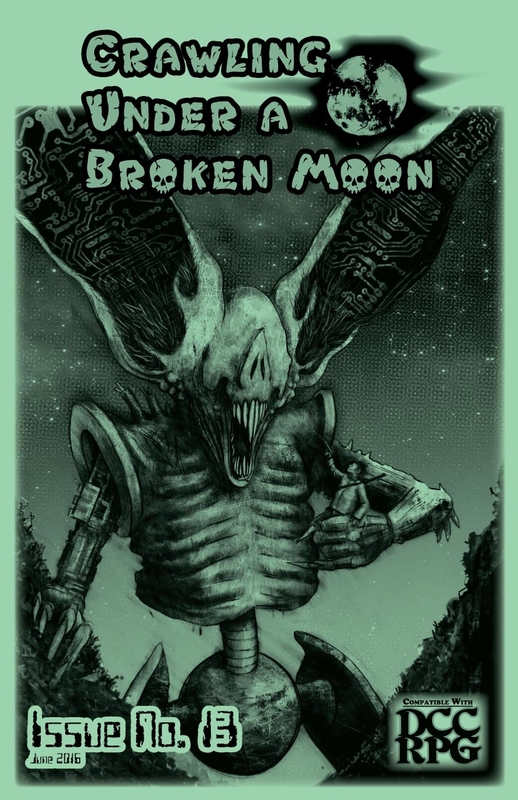 Crawling Under a Broken Moon #7 was written by Reid San Filippo, Sean Ellis, and Daniel J. Bishop, and published by Shield of Faith Studios. Disclaimer: I wrote a creature that appears in this issue's Twisted Menagerie. When Issue #5 focused on the Kingdom of Aetheria with its Masters of the Universe vibe, I had worried a little that Crawling Under a Broken Moon was beginning to run out of steam. How ill-founded those fears were! The post-Apocalyptic genre is as fertile a playground as the typical run of fantasy gaming, and, rather than taking a departure from its focus on post-Apocalyptic play, Shield of Faith Studios continues to examine the numerous possible facets gaming after the End of the World can take. Issue #7 is a bit more of a hodge-podge than the rather more tightly focused issues that preceded it. It is hard not to get the impression that some of this material simply could not be fit into previous themed issues. This is not a complaint; there is some really good stuff here. A lot of games have tried to deal with the concept of cybernetic PCs, with varying degrees of success. I think that the authors here nailed it, providing a meaty class that fits well with the Dungeon Crawl Classics and the Crawling Under a Broken Moon vibe. You could use this class with Nowhere City Nights to get a Judge Dredd-style game. In The Road Warrior, Mad Max encounters a gyrocopter pilot. Now you can, too. Or you can become one. Rules are provided to cover the operation of trains, gyrocopters and ultralights, and mechs (and similar robotic vehicles). Appropriate wipeout tables are provided. How the new vehicles work with the Petrol Head class (and others!) is also described, for each vehicle type. If you are playing in the Brimstone of Black Powder, Black Magic, you may find the rules for trains rather useful. This issue focuses on the Citadel of Scrap, a "major city in the wastes devoted to technology, transportation, and trade", and also a convenient hub for adventure hooks in the Umerican wastelands. Written by Sean Ellis and Reid San Filippo, the article covers history, layout, job opportunities, and a new monster, the Scut, once-humans drained by the God in the Pit to become "little more than dry sponges in search of humanity to absorb". The God of the Pit, you ask? Well, "within the last decade a great meteor crash decimated the part of the city known as the Ruins. It is believed that a god-like being slumbers at the bottom of this crater, gaining strength until he may awaken and eat his enemies and all they love." An additional "interesting place to die", the Rail Wastes are the wastelands where rail lines are still operating (at times) between the Citadel of Scrap and whatever destinations it is still in contact with. The focus is on adventure, and things that may happen to make your journey by rail more interesting. Sean Ellis provides a brief rundown on what now works as coinage in post-Apocalyptic Umerica, from pretty bits of bead to promissory notes for gas, or even water purification pills. Now, do you spend your treasure, or do you use it? Finally, the issue describes three new creatures. Remember how last issue made me think of statting up Stephen King's Christine? In this issue, the Autogiest has done the work for me. It is exactly what it sounds like: a possessed vehicle that wants to kill you. The Bounder is a mutant descendant of the kangaroo, loosely inspired by the hoppers of Sterling Lanier's The Unforsaken Hiero. Of course, being Umerican, they have some special powers that hoppers certainly do not. This is the creature I wrote for this issue. Cybernetic attachments that are no longer wanted, the Discarded "are driven by a hate the people that rejected them and a desire to continue their existence by seeking out new implants to incorporate." If you are a Doctor Who fan, as I am, you will be reminded of the bits of Cybermen around the Pandorica. Star Trek fans may think of Borg implants that infect new hosts. Either way, this is a potentially horrifying monster, and one that, with its relationship to Cyborg characters, brings the issue to a satisfying close. Crawling Under a Broken Moon #6 is written by Reid San Filippo, Chris Tamm, R. Dale Bailey Jr, and Sean Ellis. It is published by Shield of Faith Studios. This is actually one of my favorite issues of the zine, which brings the full Mad Max experience to Umerica...but still being very much Dungeon Crawl Classics. So let's jump right in and see what we have. "The wastelands are teeming with life and it all wants to rob, kill , and eat you, hopefully in that order. If you want to survive you need a good set of wheels, the ability to find what you need, and the will to do what it takes to stay alive." Can your average Umerican PC drive a car? Ask your judge. If you absolutely must drive some sort of vehicle, though, this class is for you. This is a strong class, which uses mechanics reskinned from the Thief, Warrior, and Dwarf to create a specific set of skills. You also start with a vehicle...not a great vehicle, but a vehicle nonetheless. Do you remember Car Wars? This was Steve Jackson Games' paean to the furious action of the original Mad Max movies and similar fare (like the Spy Hunter arcade game!). It was a bit fiddly, being more of a war game than a role-playing game, but it was fun. Here, you are given rules to drive around and kill things Umerica-style, with a little less fiddling and a lot more role-playing. Rules are given for wipeouts, chases, ramming, and all the other goodness one would expect. "Popping the Hood" is a form of "Recovering the Body" for vehicles. Fuel consumption is abstracted in a way that works. Suddenly, the mending spell is really, really worthwhile! In the post-Apocalyptic wastes of Umerica, not every vehicle is going to be the same. Therefore, rules are presented for creating new ones, by building off the basic statblocks of more familiar types of transportation. Vehicle quality levels and traits can make each vehicle different from others with a similar build. Most of the usable vehicles you encounter will surely be Beaters, but finding a rare Custom vehicle is like finding a magical artifact! Of note is the "Possessed" trait, allowing a car to be "powered by an entrapped elemental or minor demon." Yes, you really can have a car that runs on blood or candy in Umerica. Or you might just decide to stat up Stephen King's Christine. What it says on the tin: a quick and easy way to generate a random (but interesting!) road gang to menace your adventurers! After all, what is Mad Max without a Toecutter, a Humongous, or an Immortan Joe? What are those villains without a gang to back them up? In the event that a gang of un-dead nuns (religious garb) driving armored delivery trucks, usiing flamethrowers (holy fire?) while out to recruit new followers isn't enough for you, the issue provides a link to another random road gang generator by Roy Snyder. If you are not familiar with Elfmaids & Octopi, you should be - it's a blog with a lot of inspirational content. This list of random encounters and stuff is originally by Chris Tamm, and DCC’ified by Reid San Filippo. It is used by permission. Some of these ideas are color. Others you could design entire adventures around. R. Dale Bailey Jr brings you the Petrol Zombie, un-dead that store gasoline in their guts. That's right - you don't want to firebomb them, and you do want to recover the fuel. Have fun with that. You might end up with petrol sickness if you aren't careful. This sort of monster is not only perfect for the issue's theme, but it is also a strong recurrent monster. They are found in zombie herds, but it is pretty easy to imagine them hanging out near old gas stations, where you are going to need to go. They make your life more dangerous, but they aso have something you want. If you are willing to undergo a bit more risk, you can gain a larger benefit. Overall, you just have to keep making choices, and that's what the game is all about.